They run free, everywhere. This was actually a rather friendly bird, and they do get semi tame since people are so amused by seeing them that they will feed the birds. If you see one, the hens will be protective of the chicks, so do be careful. The birds have been there for years back before it turned into a tourist town wandering around and feeding themselves off of random bugs. Of course the locals then didn't have a problem with catching one and tossing them in the stew pot. I don't doubt that it still happens but isn't quite so frequent these days. 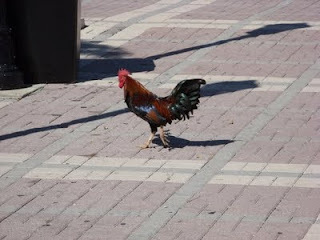 The city of Key West was hunting down the birds for a while but gave up when people put up a fuss. There are a bunch of websites out there telling the story of the chickens and how the Conch's that live there wanted them to remain. Its more local color and frankly I'm happy they're there.